Heat pumps extract energy from the ground, air or water and convert it into heat to be used for heating and hot water. They work on a very similar principle to your refrigerator, moving heat from the source through a heat exchanger, where it is concentrated to a much higher temperature and then delivered to the required area. What type of Heat Pump system would suit my home? There are some general pointers to bear in mind when choosing a system, however it is best to talk through your options with one of our advisors to find the best solution for your needs. They are generally very well suited to a new build, as opposed to retrofitting to an existing house. This is due to reduced costs of the heat pump being included as part of the building, rather than fitting under floor heating later. However, heat pumps can also be used in older buildings and with radiators. Heat pumps need very little maintenance, there are no serviceable parts or emissions to check and so are ideal ‘fit and forget’ systems. In order to properly evaluate your individual household needs we would need some more information to find the amount of heat currently lost within your home. This would include taking measurements of the total living area and then assessing walls and floor materials. 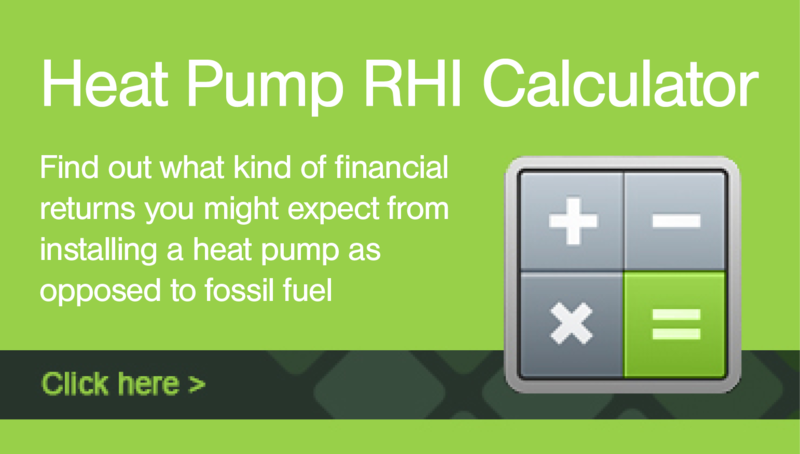 This information also helps us to help you to meet the Renewable Heat Initiative requirements. What is the typical CO2 Saving? This will vary considerably according to the type of fuel being replaced as well as the household needs. However, an average domestic setting can make a saving of between 1.5 to 11 tonnes of carbon dioxide production each year. The overall costs will vary according to the type and size of heat pump system that is right for your household’s needs. However, an average domestic system can cost upwards from £10,000, with Government schemes also available to offset the initial installation outlay.